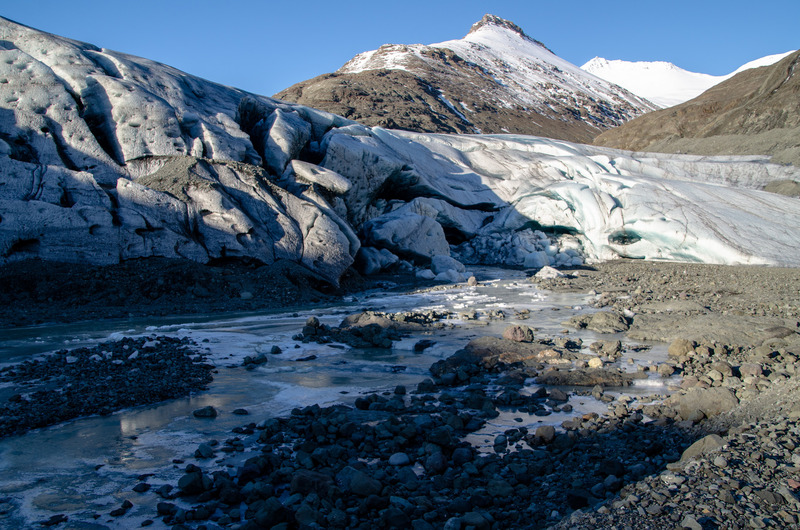 I learned a lot about glaciers and how life in Iceland is very directly shaped and influenced on a regular basis by the earth and weather patterns that surround people there. And I will be the first to say that I do not remember everything I heard or saw on this trip, but some elements do stand out from our day trip to [actual name of national park] and the Ice Caves tour. Glaciers are big. I mean really, really big. So much so that you cannot fathom the size of it as you stand at the edge of one it becomes more awe inspiring to know that this huge “sheet” of ice holds within it not just frozen water, but parts of mountains, trees, likely animal remains, volcanish ash (maybe exclusive to Icelandic glaciers), and other parts of the earth that couldn’t get out of its way. Glaciers are affecting the world around it while it appears to sit there like a big, frozen glacier-shaped log. As they move and/or melt, what remains after are what many area of the world now live on. They have flattened out vast spaces in their melted wake. But they also hold down the earth under it, even pulling nearby hills and small mountains physically down with its incredible weight. (Don’t try finding a scale. Glaciers don’t like to talk about their weight.) So as it melts and loses even small fractions of its mass, Iceland itself is actually rising from the relief of the cold burden at a rate of up to 1.5cm/year. Insane! Glaciers are really pretty from far away and up close. The edge of the glacier! 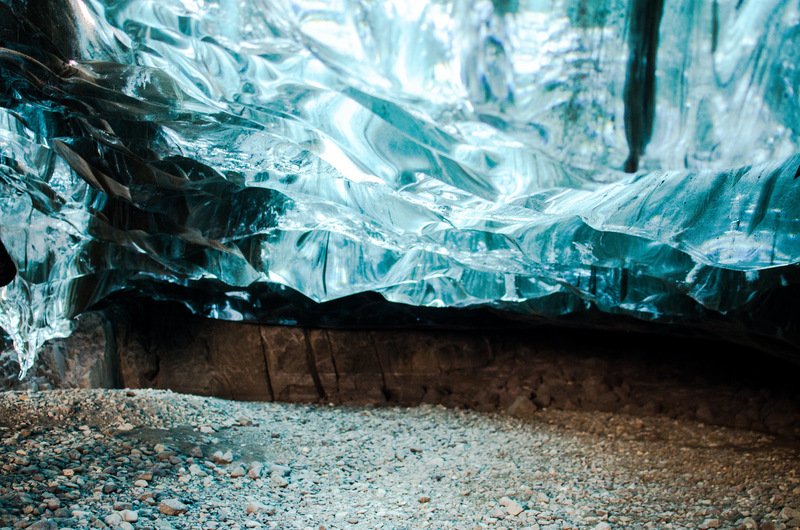 The ice caves at the edge of the glacier. So. Beautiful. I thought there may be some good life lesson to be found here. Perhaps there is a lesson about some big things do change us, but in very small ways and steps that aren’t immediately apparent if we stand back and take stock of who we were and who we are now. Maybe there’s a glacier in your life now that you want to rid yourself of because you feel like it’s holding you down, but in reality it’s providing a stable environment we don’t appreciate until it’s gone and things go haywire. Yesterday I came back to what feels like my home away from home: Prague. After spending 2 weeks here to start my sabbatical, I’m back at Sir Toby’s where I first stayed when I arrived – even back in the same room! There’s a certain comfort in starting and ending this trip in the same place. I suppose it gives it a sense of completeness, like closing the loop on the experience this has been. I only have 5 more full days here before I return to reality on Friday. Though there isn’t much I want to do, I plan to make the most of the time by seeing one or two more sights and spending my free time reading and journaling/blogging. One of the main purposes of this sabbatical was for rest and I have no qualms about the fact that I didn’t see everything. Even if I had, would it matter much in the end? And while I’ve thoroughly enjoyed being away, I do have some excitement building in me for getting back to what is familiar. The photo below, also taken during the first week in Prague, was taken just outside this hostel as I was heading out for the day. For anyone from or connection to Chicago, this will bring a smile to you. I think I now know where Chicagoans got the idea. My Internet time is somewhat limited, so I’m only posting a couple photos of Zurich by night. Tomorrow, at some point, I will head off to Lucerne where I’ll stay for 3 nights. I seem to be feeling a bit better finally. Maybe it just took some new scenery and sunny skies (thanks for all the rain, Munich!) to clear me up. For now, enjoy the few pics below.